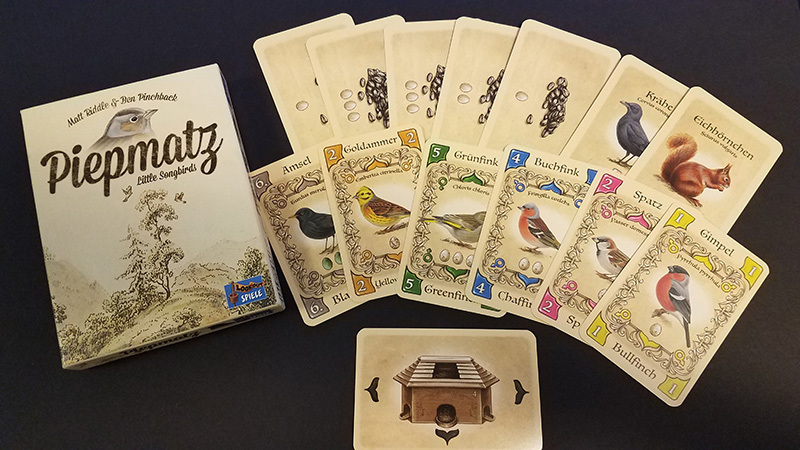 Piepmatz is a beautiful, highly playable card game of feeding birds. It's incredibly accessible without being the slightest bit thoughtless, and it's a delight to play. Hi! Jess here, and today, for our review of Piepmatz, I want to do something a little different. Normally, we do the whole ‘dialogue, then rules, then observations, silly the-whole-time’ thing, but in getting ready to review this great little hand management card game from Ben Pinchback & Matt Riddle, I want to share something of a story. It’s personal and sensitive, but I promise it’s also about Piepmatz (it might take a bit to get there – just stay with me). Cool? Cool. It’s mostly a story about my mom. I had a tough time connecting with my family when I was a kid. 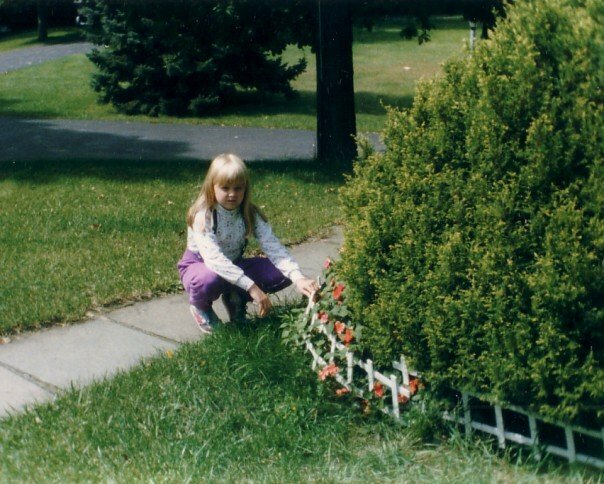 My father had a lot of issues that drove me to spend as much time outside as possible. For most of my childhood, I ended up building forts out in the woods near my house and creating imaginary adventures for myself in the backyard. In most of my memories, I was alone. Bruce banner had nothin’ on me. Look at those pants! The inevitable divorce was messy and took years to resolve; pushing me even further away from being comfortable around my family. My lawyer worked hard to my mother gain sole custody of me and my sister, and while it was a relief to not be forced to see my father anymore, I wasn’t very close with my mother either. She hadn’t done anything wrong. “Family” just wasn’t a safe place anymore. 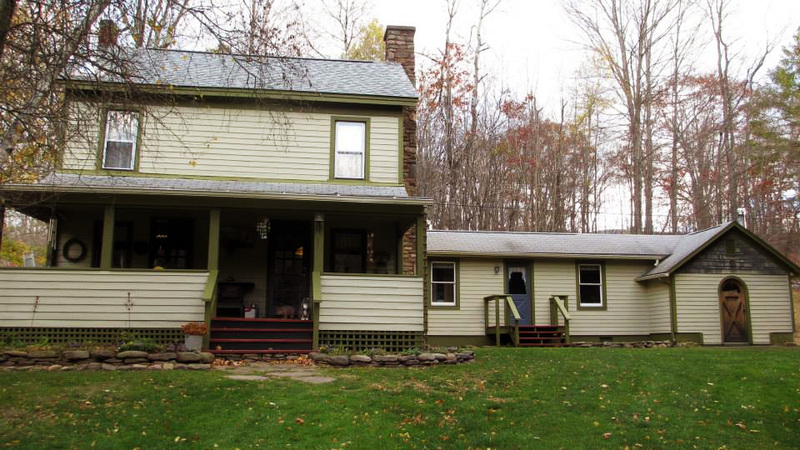 When it was time for college, I moved away from the farm and the distance created a vast ravine between us. For many years we were tacitly estranged in this weird “I’m not mad at you. I just never call or visit” sort of way. But, thankfully, things changed. 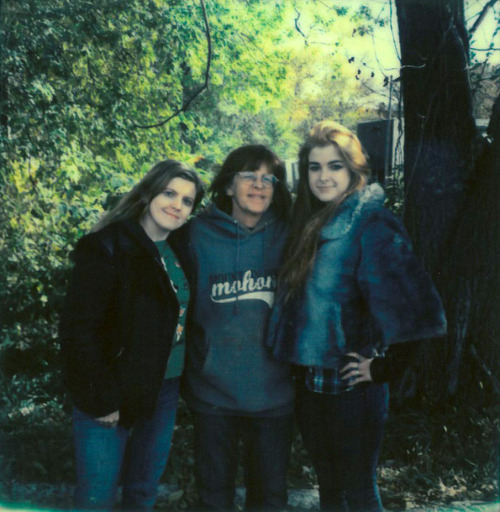 With time came perspective and healing (for all of us), and my mom and I have a much better relationship now. My visits back home are far more frequent and always a great time, and whenever I go, I like to bring along a few games. Games were one of the few things we did together when I was a kid and they still give us an excuse to spend more time together, laughing and having fun. 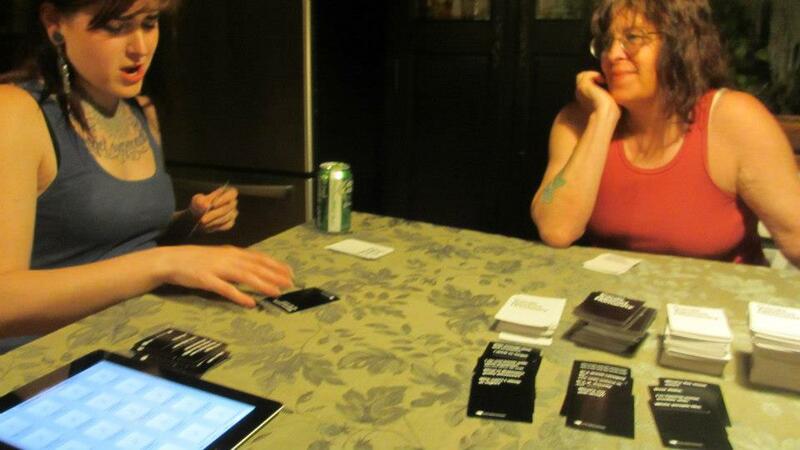 My mom and sister playing Cards Against Humanity. Inappropriate? Sure. But they laugh themselves to tears every time we play, so it’s worth it. That said, it’s been a struggle to get my mother into board games nowadays. When we used to game, we’d spend hours playing classic card games like Go Fish and War and we played quite a bit of Monopoly (even though we never quite ever finished a whole game, as most of the time we were interrupted by a cat dive-bombing the board), but those days are long since gone. My mother doesn’t like anything that seems complicated or long or unfamiliar, but she loves farming and animals, so I try to curate a small collection of card and board games that have nature themes that will appeal to her and mechanics that are easily explainable. This is where Piepmatz fits in. See, I promised I’d get there! With its’ hand-management/set-collection gameplay, Piepmatz feels like a classic card game; what designers Ben Pinchback & Matt Riddle have created plays so much like a modern spin on old-school trick-taking games that it feels immediately familiar, yet fresh. Adding to Piepmatz’s appeal is the Audubon-esque art by Mike Langman. It immediately caught my mother’s eye as soon as it hit the table, and she started going through all the birds as soon as I showed her the game. The theme is accessible and beautiful, making it a perfect game for her. The aim of Piepmatz is to collect birds by attracting them to your bird feeder. The feeder is placed in the center of the table with a column of seed cards above it. You’ll start the game with a hand of bird cards and each turn you need to play 1 bird card to any of the perches on the bird feeder. If there is already a bird at that location, then your bird must wait in line on the ground (birds, of course, are well-known for their respect of bureaucracy). If the combined value of the birds on the ground ever exceeds the value of the bird at the feeder, you collect the bird at the feeder. 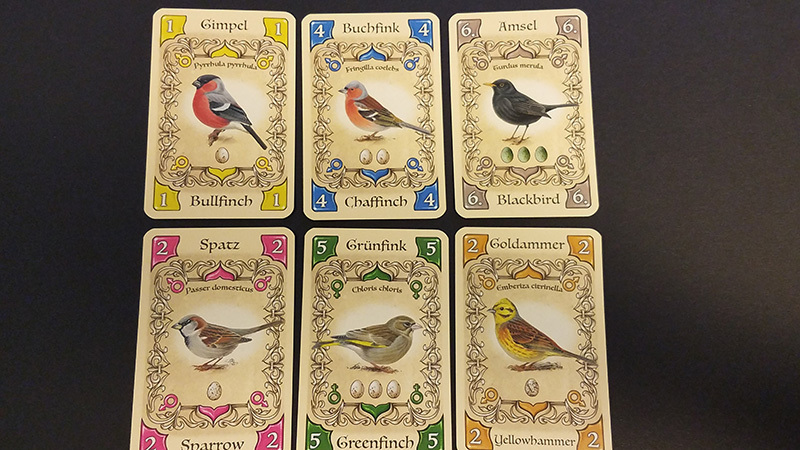 The difference between the bird you collect and the ones that pushed it out will determine which seed card you draw. This can be great if it wins you a high value card, but it can also mean you might end up picking up a pest along the way. With bird and seed collected, move the next bird on the ground up to the perch, and evaluate this situation again to see if the new bird will be pushed out by the ones in line. Keep doing this until the bird at the feeder is the dominant value. 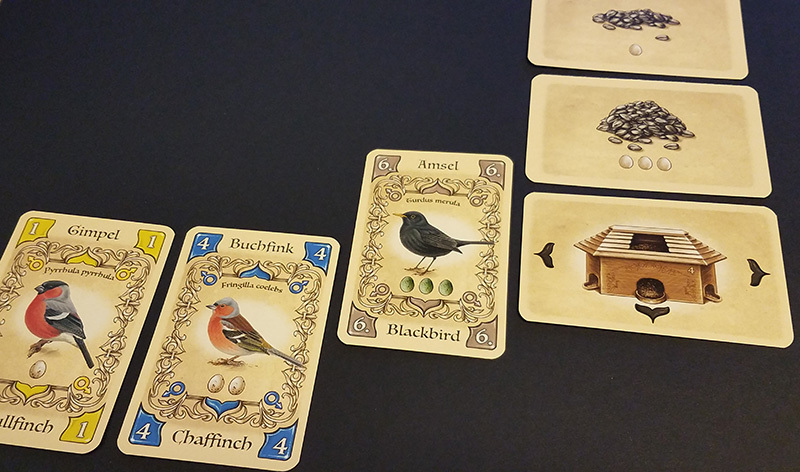 By playing birds into the line strategically, you can manage to gather up a tidy sum of birds. The birds & seeds you collect this way are placed in your scoring piles. 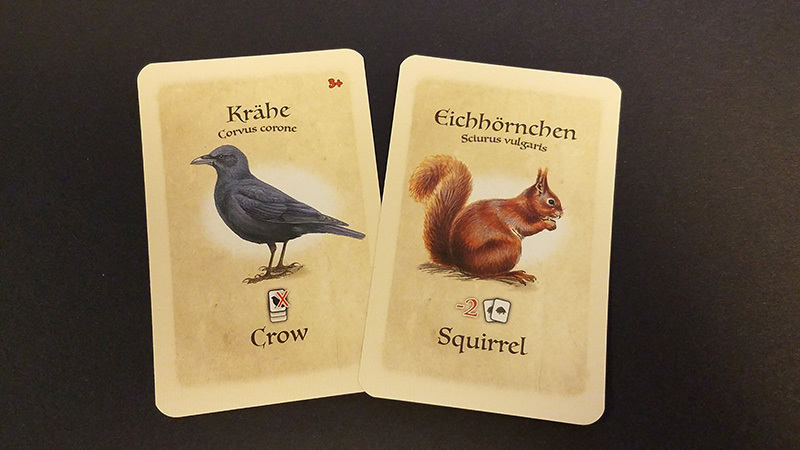 The crows and squirrels I mentioned earlier are cards that have been shuffled into the seed deck and are trouble makers. When one of these pests comes out, it is placed next to the bottom seed card (there can only ever be 1 pest attached to a seed card, so if another is drawn it will go to the next card in the column). When you collect a seed card with a pest attached, you must carry out its action. The Crow scares off a bird from the a species you have the most cards of. 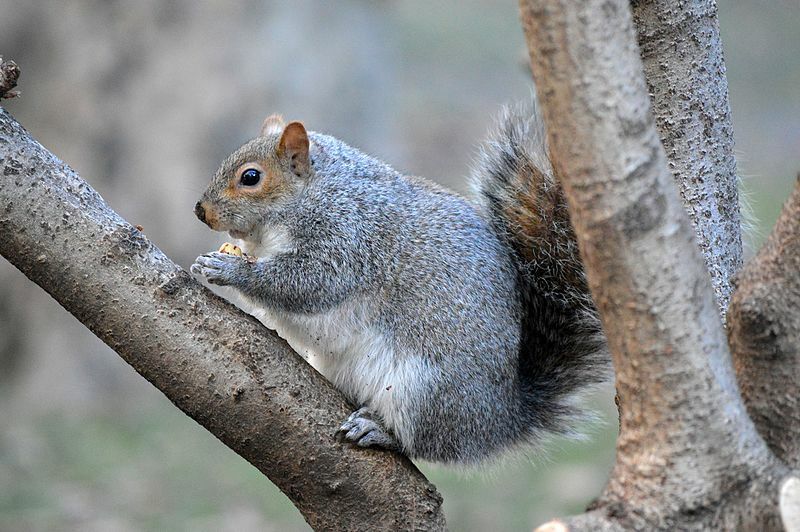 The greedy little squirrel eats two random seed cards from your score pile. Jerks. Look at this big jerk. GIVE ME BACK MY SEEDS! 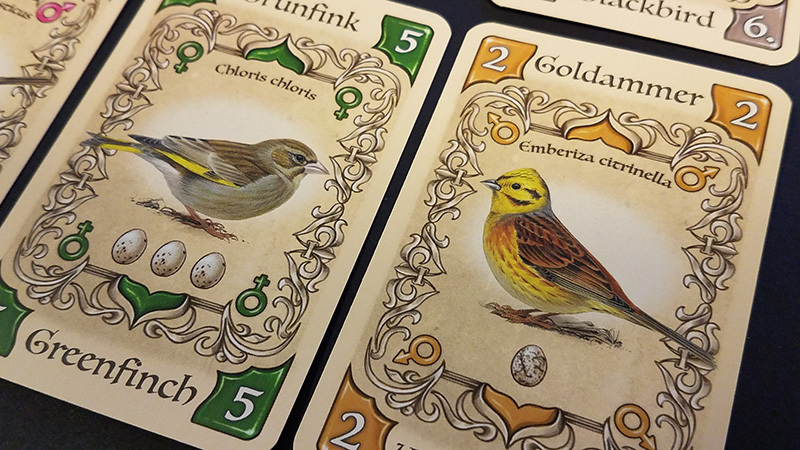 At the end of the game, you score points for mated pairs of birds, species majorities, and points from seed cards. The ‘mated pairs’ mechanic is neat because it potentially adds worth to the lower-value, easier-to-collect birds that tend to be worth less points by themselves. But regardless of where they came from, the person who earned the most points is the winner! When we played recently at my family farm, my mother utterly destroyed us with her bird-collecting prowess. We had a fantastic time talking about life and such while our birdies piled up and all the problems of the past stayed where they belong: in the past. Piepmatz is exactly the sort of game that fit the moment – light but not thoughtless, engaging but not consuming, and just plain fun. But what did my mom think of the game? Well, I asked! Jess: Hey Mom, did you like Piepmatz? Jess’s Mom: Oh yes. I enjoyed that one. If you’re doing a review say it’s good for teaching old dogs new tricks! Jess: Mom, you’re in the review right now. Jess’s Mom: I am? Wait, on the internet? Jessie, you have to warn me before you do that! Jess: Mom, it’s fine! I just wanted people to hear what you thought of the game. I’m glad you liked it – was there anything in particular that stood out? Jess’s Mom: Well, it’s very pretty, and I do like the birds a lot. And it was easy for me to learn, which isn’t always true with the new games you bring. But mostly it was that I beat you kids by a lot of points. So there you have it. Not only is Piepmatz a great hand management game with fantastic art and my Mom’s Seal of Approval, but it also joins the handful of honored games that I can share with my family as we continue to bridge the gaps formed so many years ago. I’m the short one in the family.